The R34 GT-R was introduced in January 1999 and bettered its predecessor's performance in almost every department. Basically, the new car is built upon the improved technology of its predecessors. Since Nissan's market research had found out that most people preferred the smaller R32's nimbleness to the larger R33's handling, the R34's length was reduced by three inches to decrease its exterior dimensions and tune the R34's handling more towards that of the R32. In correspondence with other technical improvements, the new R34 has thus become the best Skyline GT-R ever. A large air dam, a long hood, and a flat windscreen - the front almost threatens the one daring to look at it. The clefted front spoiler seems to consist of nothing else but air inlets, and almost appears to touch the road. Staring back at you through narrow, clear, and canted headlights this car looks like a samurai ready to fight. And ready it definitely is. Standing on 245/40 ZR18 Bridgestone Potenza RE040 tires (developed specifically for this car), the R34 Nissan Skyline GT-R ducks low above the ground, its extensive wheel-housings making it look even wider than it actually is - in reality the R33 is just 5mm narrower. Understated? Certainly not! Overstyled? Maybe! But aggressive the Skyline GT-R surely looks. The design of the side is more supple in style though, with the low-profile Potenzas on 18-inch six-spoke alloys and the emphasized fenders underlining the coupe's sporty bodylines. 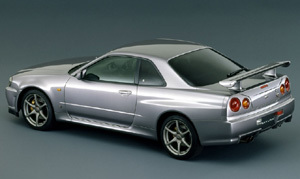 Although it is three inches shorter than the R33 (184.1 in. 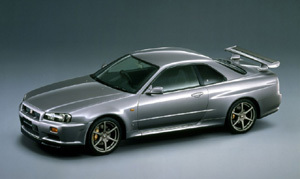 ), the R34 GT-R's profile still looks very impressive - even without resembling the front's aggressive styling. This is mostly true for the car's rear as well. The adjustable rear wing and carbonfiber underbody diffuser (only for the V-Spec) not only distinguish the R34 Nissan Skyline GT-R from the sedans and standard coupes, but also aid its high-speed stability considerably.